Last week I wrote a tutorial on invisible fences for dogs. Or, better defined, “pet containment systems”. As you recall, my in-laws had a buried wire system for their German Shepherd named Luther. Luther was a formidable dog. A rescue dog, Luther was big, fast and ferocious. As an example incident, the Jehovah Witnesses stopped visiting my in-laws when Luther decided no one at his address was going to convert (ever). Luckily for the Jehovah Witness, he visited my in-laws wearing a raincoat. Luther shredded the coat while pulling it off the soliciting evangelist. The raincoat distraction gave the Jehovah Witness precious seconds to retreat back into his car. Luther also liked to chase bicycles. He was able to run down a bicyclist riding full speed. Despite the biker’s colorful aerodynamic clothes, Luther was able to close the distance and provide a “wind sprint” exercise opportunity. Despite his fierceness, Luther was extremely tolerant of our young daughters. He endured a lot of undeserved ear and tail pulling. Luther loved the girls and was very protective. Ultimately, my in-laws installed an electronic pet containment system to keep Luther in the yard. However, Luther was undeterred. Luther bolted through the electronic fence accepting the zap of electricity in the process. Pursuit must have been worth the pain. So, fast-forward to a family summer picnic. Luther is still bolting through the fence. Over “some” beers, John and his brother deduce the electric shock supplied by the dog’s collar is too weak to deter Luther. So, in a flash of intellectual (non) brilliance, these two grown (and educated) men decide to try running through the invisible fence wearing the dog’s collar! How else can one ascertain if the electric shock is substantial enough? Why not try it yourself? Obviously, trial is the best way! My husband does confess it was not his best moment. I attribute the decision to alcohol, testosterone, bravado and sibling rivalry. John was the first to don the electric shock collar and run through the invisible fence. At full sprint, John received a ten thousand volt, half-ampere electric shock. It buckled his knees as he exited the “fence”. John recovered from the voltage on his hands and knees. Not to be outdone, John’s brother performed the same feat with the same result, down on the ground, on hands and knees. For the life of me, I can’t imagine! I reflect often on my husband’s dog collar incident and ponder the nature of males. I take solace because these dog-collar-wearing males are same ones that go to Kuwait, Kosovo, Iraq and Afghanistan. These males endure physical and mental hardships that are uncomfortable to consider. These males go to nasty places to do the nation’s dirty work. They answer the call and go because the nation decided. Some go and are gone forever. So my metaphor this week is when your husband dons an electric shock dog collar, he deserves some slack. Follow me on Facebook at http://www.FB.com/ReliefWithJulie! An invisible fence is an electronic system that prevents pets (mostly dogs) from leaving a yard. A buried wire in the yard is energized with coded signals. A shock collar on the dog receives these signals. When the pet approaches the buried fence line, the collar makes a warning sound and then gives the pet a harmless electric shock. The pet soon learns to avoid the invisible fence location, making it an effective virtual barrier. Although called "fences", these fenceless boundary systems are more accurately termed “electronic pet containment systems.” These systems are less expensive and more aesthetically pleasing than physical fences. One popular brand claims more than three million installations. Most pet fence systems are one of three types. Most common is the aforementioned buried wire that emits a radio signal to activate the receiver collar. Other pet fences are wireless. Rather than using an underground wire, they emit a radio signal from a central unit, and activate when the pet travels beyond a certain distance from the unit. Other sophisticated systems use GPS signals to determine proximity to a predetermined "virtual fence", without the need for any physical installation at all. These GPS systems allow additional flexibility, such as inclusion of "islands" within the containment area, and easier changes to the boundary. Although, location of the boundary is only as precise as GPS. The first commercial underground fencing system was patented in 1974 by Richard Peck, owner of Invisible Fence Company. However, there are drawbacks to these various systems. Underground fences cannot exclude other animals. A dog contained within an underground fence can still fall prey to a larger dog or coyote, or even a person looking to harass or steal animals. Also, this type of fencing does not provide a warning to humans who might inadvertently wander inside the perimeter. Children or other persons may still be able to approach dogs or other animals that are confined by an invisible fence. And, the fence may cause the behavior of a confined animal to appear better than it actually is. This type of containment is also not maintenance free. This system requires functioning batteries in the animal’s collar. Finally, underground fencing is not accepted by every animal. Some pets become too afraid to wander their yards for fear of being shocked. And lastly, an electronic fence may not be effective if an animal crosses a boundary while in a state of excitement. This was the case with my in-laws dog, Luther. 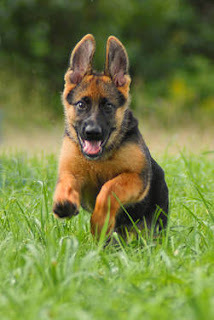 Luther was a formidable German Shepherd who often bolted, at full speed, though the electronic fence. Luther resolved to endure the electric shock for the sake of pursuit. Unfortunately, Luther could run a lot faster than my husband and his brother when they both tried the collar! Read my column next week to learn what happened when these two grown/educated men tried to run through the invisible fence wearing the dog collar! And, visit me online at http://www.FB.com/ReliefWithJulie. Woodpeckers are categorized in the family Picidae. They are found worldwide, except for Australia, New Zealand, Madagascar, and the polar regions. Most species live in woodland habitats. However, some live in rocky hillsides and deserts. There are about 200 species of woodpeckers. The smallest woodpecker is the Bar-breasted Piculet at 0.2 ounces and 3.25 inches. 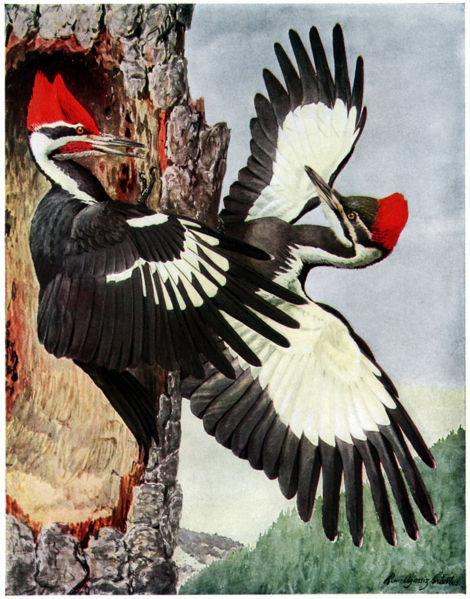 The largest woodpecker is the Imperial Woodpecker at 23 inches and 1.3 pounds. Woodpeckers have strong beaks for drilling trees and long sticky tongues for extracting food. The chisel-like tip of the beak is kept sharp by pecking on wood. Species of woodpecker and flicker that use their beaks in soil or for probing, as opposed to regular hammering, tend to have longer and more curved beaks. Many of the foraging, breeding and signaling behaviors of woodpeckers involve drumming and hammering using the beak. To prevent brain damage from the rapid and repeated impacts, woodpeckers have evolved a number of adaptations to protect their brains. Adaptations include a small brain size, the orientation of the brain within the skull (which maximizes the area of contact between the brain and the skull) and the short duration of contact. The millisecond before contact with wood a thickened nictitating membrane closes, protecting the eye from flying debris. The nostrils are also protected. They are often slit-like and have special feathers to cover them. Woodpeckers possess zygodactyl feet. Zygodactyl feet consist of four toes, the first and the fourth facing backward with the second and third facing forward. This foot arrangement is good for grasping the limbs and trunks of trees. Woodpeckers can walk vertically up a tree trunk. This important skill is beneficial for foraging and nest excavation. In addition to the strong claws and feet, woodpeckers have short, strong legs. This is typical of birds that regularly forage on trunks. Also, the tails of all woodpeckers are stiffened. Woodpeckers are better able to perch on vertical surfaces because their tail provides support. One spring, my husband John battled a woodpecker. The house had cedar siding. Evidently, the cedar siding was dessert to this woodpecker. Despite rubber snakes, plastic owls and pepper wash, this woodpecker got the best of my husband. The drumming on the rain gutters mostly occurred on weekend mornings when we tried to sleep in. The hammering sound was deafening! Defeated, my husband surrendered and resorted to just repairing the siding every two weeks. Eventually, the woodpecker got its fill of our cedar siding and moved on. So, the obvious theme of this week’s metaphor is woodpeckers. John says, “Pet woodpeckers on wooden boats are a bad idea.” Who are the “woodpeckers” on the “wooden boat” of your life? Do your family members peck at you? Perhaps a friend is no longer supportive. How would characterize your relationships at home and at work? Maybe it is time to remove the woodpecker from your boat and put it ashore! Want a strategy for doing so? Contact me online at http://www.FB.com/ReliefWithJulie. I contend that people need a litmus test to aid their decision- making. My husband John, a twenty-six year veteran of the U.S. Marine Corps, used these three “litmus” tests as leadership tools for his decision-making. Test number one: “Would this action make my mother proud of me?” This first test is the simplest. If your mother would disapprove, you are probably making a poor decision. Picture your mother at church or among friends. If she would be uncomfortable discussing your action with friends, perhaps some more thought on your intended action is required. The bottom line is execute a course of action that would make your mother proud. Test number two: “How would this read on the front page of the newspaper?” What if your action was reported on the front page of the Pamlico News? How would it be reported? Would it be a positive or negative article? If your action would result in a front page scandal, perhaps you should reconsider. Assume the reporter writing about you is hostile. Consider again your intended actions if reported on the front page. What are you going to do? Now, the last test is a bit more complicated. Test number three: “What would my boss’s boss want me to do?” When making a decision, think two levels up. Consider the impact of your decision on your boss. Would your boss get “heat” from above? Usually, bosses accept less risk than younger employees. That is why this third test is an important risk management tool. Your boss’s boss will usually want you to choose a less risky, conservative course of action. In addition, your boss’s boss does not want any scrutiny. Do not put yourself and therefore the company, in a bad light. So, this week I recommend these three litmus tests. I guarantee they will serve you well through ninety percent of your decision-making. For the other ten percent, contact me by visiting my website at www.FB.com/ReliefWithJulie. Quercus Suber is the scientific name for the cork oak tree. The cork oak is a medium-sized evergreen. It is the primary source of cork for wine bottle stoppers and cork flooring. The tree is native to southwest Europe and northwest Africa. Here in the United States, the cork oak is favored by many horticulturists as a hearty, evergreen shade tree. Mature trees can reach seventy-five feet tall and form a broad canopy of toothed, shiny dark green leaves that are silver-gray underneath. Chocolate brown acorns are held loosely in caps and provide food for birds and small animals. The cork oak can be planted in a variety of well-drained soils and has water requirements ranging from dry to moderate. The cork oak is particularly favored in coastal regions as it is impervious to salt spray. The most important planting limitation is exposure to frost. The oaks are considered to be soil builders and their fruits have been shown to have useful insecticidal properties. The cork oak forms a thick, rugged bark. Over time the layer of bark can develop considerable thickness and can be harvested every nine to twelve years to produce cork. The harvesting of cork does not harm the tree. In fact, no trees are cut down during the harvesting process. Only the bark is extracted, and a new layer of cork re-grows, making it a renewable resource. The tree is cultivated in Spain, Portugal, Algeria, Morocco, France, Italy and Tunisia with Portugal accounting for around fifty percent of the world cork harvest. Cork oaks cannot legally be cut down in Portugal, except for forest management felling of old, unproductive trees. Even in those cases, farmers need special permission from the Ministry of Agriculture. Cork oaks live about 150 to 250 years. Virgin cork is the first cork cut from 25-year-old trees. A tree can be harvested about twelve times in its lifetime. Cork harvesting is done entirely without machinery, being dependent solely on human labor. Usually five people are required to harvest the bark of one tree. The process requires training due to the skill required to harvest bark without harming the tree. The European cork industry produces 300,000 tons of cork a year, with a value two billion dollars and employing 30,000 people. Wine corks represent fifteen percent of cork usage by weight but sixty-six percent of revenues. So this week, corks provide me the opportunity to tell you about being “bottled up”. Many of my clients express their dismay over their particular life situation. Often they are stuck in an unfulfilling job or relationship. They are unable to move forward and gain improvement. However, moving forward in a job or relationship requires an exact knowing of the real problem. For example, the first step is knowing if they are stuck or if the situation is stuck. Too often, we have the wrong answer and remain corked in the bottle. To get uncorked, contact me by visiting me online at http://www.FB.com/ReliefWithJulie.